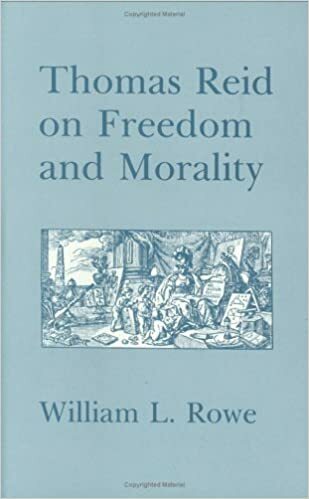 William Rowe gives a fantastic discussion on how British philosophers from Locke to Reid dealt with the problems of free agency and determinism. Regardless of whether one is a free will theist or a determinist, Rowe nicely clarifies what each thinker believed on these subjects. Rowe begins with Locke’s Volitional Theory of Action. Actions are of two sorts: thoughts and motions of the body. The action is preceded by a certain act of will. S is free with respect to action A just in case it is in S’s power to do A if S should will to do A and in S’s power to refrain from doing A if S should will to refrain (78). Necessary agent: a person’s actions are determined by the cause preceding those actions. This does not conflict with Lockean freedom, for Lockean freedom does not require that given the causes we could have acted differently–only that we act. Problem for Locke: what determines the will on a given occasion to suspend some desire that is otherwise strong enough to move the will towards some other action (Rowe 10)? Rowe offers a devastating counter-factual scenario: if I inject you with a drug so you can’t move your legs, then on Locke’s view you aren’t sitting freely. But if instead I hook your brain to a machine where I take away your *capacity* to will otherwise, on Locke’s account it would seem that this is a “free action,” since nothing is “making me” sit down. Point of clarification: thoughts and bodily motions that are actions are caused by volitions, and the volitions themselves, although not caused by other events, are caused by the person whose volitions they are (31). The person is the cause of the volition. his is substance causation. It is not reducible to causation by events. FWA (free will advocate) do not deny that events cause actions, pace Jonathan Edwards, but that these events have a prior cause in agents. Event causation: roughly a physical event. Rowe argues that a necessitarian cannot consistently see herself as an agent cause of some of her actions (64). Something cannot cause me to be the agent-cause of an action. Being caused to cause A implies that, given the cause, one lacked the power not to cause A (67). 1. An agent must have the power to bring about the act of will. 2. The power to refrain from bringing about the act of will. 3. Exert her power to bring about or refrain. Reid’s most controversial point: every event has an agent cause (quoted in Rowe 55-56). Rowe is a good enough philosopher that he sees where Reid’s argument could go, though Reid himself didn’t make much of it. If every event has an agent cause, then at the root of the universe’s existence is a Personal Agent. positive thesis: free acts of will are caused by the agent whose acts they are (76). In contrasting Reidian freedom with Lockean freedom, Reid never says that an agent must have been able to do otherwise if he had willed to do otherwise. What is the difference between the power to will to refrain from doing A (Locke) and the power not to will do to A (Reid)? For Reid the power to will is the power to cause the act of will. Locke gives a scenario of a man locked in his room. He wills to stay in his room but he doesn’t know it is locked. For Locke, the person acts voluntarily but not freely. But here is the problem for Locke: the locked door causally necessitates his staying in the room, it does not causally necessitate his voluntary action of staying in the room. volition (for Reid): an act of the mind, a determination of the mind or will to do or not do something (87). 1. Certain actions are in our power. 2. Bringing about these actions requires that we will them. 3. Actions that are in our power depend upon the determinations of our will. 4. If actions that are in our power depend upon the determination of our will, then the determinations of our will are sometimes in our power. 5. The determinations of our will are sometimes in our power. This book, while technical at times, is a fine addition and even introduction to the free will debate. One of the common rebuttals to Calvinism is the claim that predestination = God’s foreknowing our future decision(s) to choose or not choose him. It’s an attractive position. It allows human dignity and responsibility yet also posits a timeless God. We will call it weak foreknowledge (Fw). (1) God foresees my future decisions. (1a) God does not cause my future decisions. Outside of Open Theism, every non-Calvinist agrees with these propositions. We must then add some conclusions about God that both sides (open theism excluded) hold. (2) God’s knowledge is immediate and nondiscursive. In other words, God doesn’t have to figure stuff out or reason his way to a solution that he didn’t know. Yes, I understand the verses but every tradition holds those as anthropomorphic. (3) God’s essence is simple and immutable. (3) says that God doesn’t change. (4) God’s knowledge is fixed. How does all of this relate to the discussion on predestination? If God’s knowledge is fixed and immutable, and if God sees into eternity future (whatever that means), then aren’t my actions just as fixed? (1*) God’s knowledge of my future decisions is a knowledge of what I will do. (5) I could have acted otherwise. Can (5) obtain? It’s not immediately clear that it can. Premises (3) and (4) point to a fixed knowledge of future events. Has the Arminian’s commitment to (1) logically reduced to Calvinism? (6) God’s knowledge of future events does not destroy certainty. Even Charles Hodge will agree with this point (Systematic Theology, II: 294-306). Hodge doesn’t actually say much on this point, simply that certainty and free choice aren’t exclusive. That is true, but he doesn’t tell us why they aren’t exclusive. William Lane Craig, an Arminian, clarifies: certainty is a predicate of persons, of knowers. Necessity is a predicate of events known (Craig, “The Middle Knowledge View,” in Divine Foreknowledge: Four Views, 127-128). Bruce McCormack agrees: “God’s foreknowledge gives him certainty with regard to what will happen. Whether the events God knows with certainty take place necessarily or contigently is a function of the natural and historical conditions under which they take place” (McCormack, “The Actuality of God,” in Engaging the Doctrine of God, 205). At this point the LFW’s commitment to (1) seems to obtain and functions as a logically coherent alternative to Calvinism. However, there still lurks some ambiguities. (7) Does the Bible teach this? I can’t go into the exegetical points here. I am simply trying to work through some logical underpinnings. (8) Granting (6) obtains, am I still really, really free? (9) The doctrine of Middle Knowledge allows one to affirm (5), (6), and (1*). Can the advocate of LFW offer (1) as a rebuttal and alternative to Calvinism? Phrase another way, (1) is logically coherent. However, the ultimate truth of (1) depends on other exegetical variables.